Aaron Stubna believes that movies are meant to be seen on a big screen. That’s what movies are made for. His idea is to give movie fans the comforts of home with good food, alcohol, and add that big screen experience along with quality films that include independent work, documentaries, and foreign films that aren’t offered in our everyday multiplex. 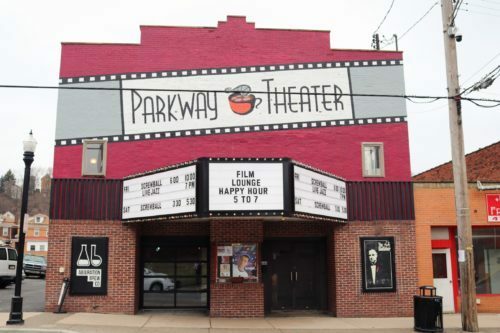 Aaron Stubna, owner and operator of Parkway Theater, has been a film fan since he was a very young age. As a boy in the 1980s, Aaron would go to see films at the Parkway Theater in Mckees Rocks. Little did he know a few decades later it would be his mission to bring life back to that very theater. The building at 644 Broadway Avenue in McKees Rocks hadn’t been used as a movie theater for more than 25 years when Aaron purchased it in 2011. Now Parkway screens new, independent films every week. In addition to the movie theater, a coffee shop and bar, the Abjuration Brew Company, has set up shop in this once overlooked building, creating a full-service theater and bar experience for movie lovers. The Parkway Theater has become Pittsburgh’s first and only “brew theater,” and offers more than movies, food and beverages. If you like any of the following, you’ll enjoy a trip to The Parkway. Karaoke, pop culture trivia, open mic, and the ever-popular comedy night are a few of the weekly offerings. If you are looking for a truly unique place to hold and event—everything from a birthday party to a corporate get-together, contact Aaron and see what options he has for you. As a movie buff and aspiring filmmaker, I appreciate what he has done for the film community. It’s inspiring to see someone have a vision for something new and different and see it through. Aaron envisions a bright future for his theater as well as the community of McKees Rocks. Special thanks to Aaron and his wife for the hospitality, and I cannot wait to see what Parkway does next!